June is going to be an extra-busy, extra-exciting month in the metro Atlanta raqs community! A number of guest superstars not seen before in metro Atlanta (as far as I know) will be rolling through town, including Ebony, Virginia, Mohamed Shahin, and Deb Rubin. Plus, local favorites Awalim, Aziza Nawal, World Belly Dance Alliance, Karma Karmelita, Jendayi Bellydance will be performing and teaching. Get out and support your sisters (and brothers) at some of these shows and workshops! Ziah and Banat Almeh will participate for the first time in the third annual Atlanta Fringe Festival, featuring dance, spoken word, and theatrical performances throughout the weekend in several venues. "Hours" will depict the hours in a woman's day through the art of tribal belly dance. Click here for a full description of all the Fringe Festival offerings, and come out and support belly dance taking its rightful place in the performing arts scene! Click here to read an interview with Ziah about her objectives for this performance. Visit the Facebook event for more details! Thursday, June 5, 9:30 p.m.
Friday, June 6, 6:30 p.m.
Saturday, June 7, 5:00 & 11:00 p.m.
Sunday, June 8, 3:30 p.m.
Congratulations to Atlanta Fusion Belly Dance on five successful years of bringing top-notch performances and instruction to metro Atlanta! I'm always amazed that this group of talented women -- whom I've known for 11 years, since I was a baby dancer -- continue to collaborate so effectively and bring us so much raqs goodness. This weekend is no exception, as they host two talented performers -- Virginia of Miami and Ebony Qualls from Washington, DC. RSVP to the Facebook event for all the latest news. Beginning Friday evening with Ebony's Urban Fusion workshop, AFBD has classes scheduled all weekend. Click here for descriptions and times. Click here to pre-register. Sunday, June 8, 5:00 p.m.
AFBD presents their fifth annual Rak the Casbah show, featuring top local and regional talent as well as peformances from Ebony and Virginia. Click here to buy advance tickets, and be sure to check out the package deal, with a ticket for this show as well as the following week's show with Mohamed Shahin for workshop attendees. VIP as well as regular seating tickets are available. Join troupe members and students for a diverse presentation at Red Light Cafe! Click here for more info and to order tickets. Many dancers have discovered how much fun it is to work with a full skirt; it's essentially a wearable prop. Learn techniques and combinations for using your skirt to enhance your performances with "Vany" at this workshop in Augusta. RSVP to the Facebook event for more details. Join World Belly Dance alliance and special guests Jendayi Bellydance as they present another opportunity for dancers throughout the community to perform in a casual, welcoming environment. If you're interesting n performing, spots may still be available for dancers and musicians. See the Facebook event for more details. Many metro Atlanta dancers have studied with She'nez at some point (she was my second teacher ever, back in 2002), and she is loved and respected throughout the community. Join She'nez in her first AFBD workshop for a fun two-hour belly dance workout! 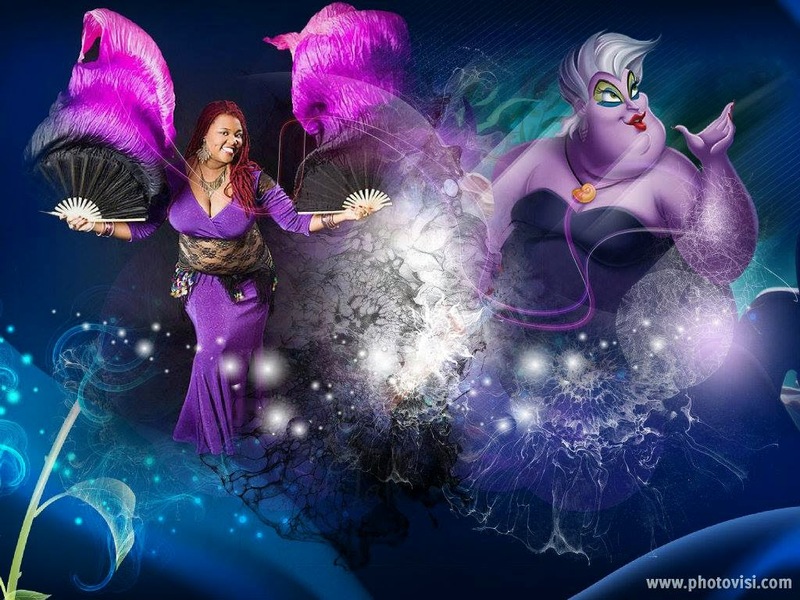 Jendayi Bellydance collaborates with a number of top local and regional dancers interpreting notorious Disney villains and other beloved Disney characters. At "press" time, performers (in addition to Jendayi's company) include Jenny Nichols, both Sabeeya and Sabia, Na'ilah, Birmingham's Ziva Saphira troupe as the cast of "The Little Mermaid," and many more. Sounds like fun, right? Click here to learn more. Click here to purchase advance tickets. 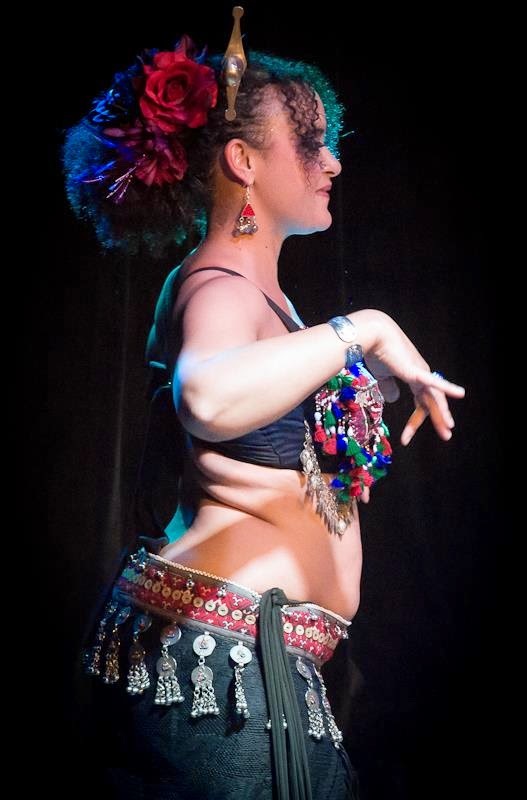 Discover the joy of Turkish style belly dance with Atlanta's own Karmelita. If you've experienced one of her performances, you know that Karmelita embodies the energy, passion, and sensuality of Turkish belly dance... something we have not seen much of in metro Atlanta recently. This performer has been a great addition to our community, and she is beginning to share her skills in private lessons and workshops. This workshop is certain to be vigorous and challenging, and will incorporate some of the latest Turkish moves from Karmelita's recent trip to Turkey. If you've been wanting to add some zesty Turkish flavor to your repertoire, this is the workshop for you! Lacy Perry and Beledi Boutique Productions bring the "queen of slink," Deb Rubin, to metro Atlanta for a weekend of tribal fusion technique and dance therapeutics. Deb is a star of the West Coast tribal fusion scene, and exemplifies the strong connection to yoga seen in much of that region's tribal fusion performers. Classes begin Friday evening at 7:00 with "Dance Therapeutics: Saving Your Belly Dance Body." Sessions continue Saturday and Sunday and include a wide variety of tribal fusion technique topics. Online registration ends Monday, May 26! Click here to buy workshop passes. Don't miss this show, featuring Ziah, Aziza, and their respective student troups and performance groups, with live music by Black Sheep Ensemble. You'll see a wide variety of styles, from ATS to modern Egyptian, and some great collaborations between the dancers and the band. Black Sheep Ensemble is a brass and percussion street band with a broad repertoire but focus on Balkan music. RSVP to the Facebook event for all the latest details! So curious to know if She'nez is still teaching, and if so where?